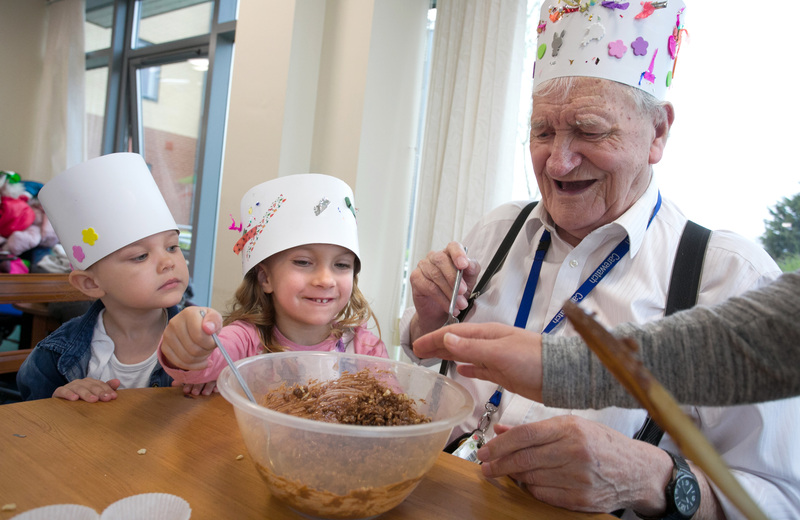 The Royal Borough of Greenwich is encouraging intergenerational learning and play in Thamesmead by introducing visits to care homes by local nursery children. Intergenerational care is the practice of bringing the young and elderly together by introducing nurseries and care homes to one another. The intergenerational practice project was introduced for under-fives from Waterways Nursery in Abbey Wood, and 60+ care home residents from Lakeview Court. The project offers all generations involved a chance to enjoy a range of activities and to form new friendships. Personal, social and emotional development involves helping children to develop a positive sense of themselves, and others, to form positive relationships within the local community. Waterways Nursery have been holding weekly visits to Lakeview Court care home since January this year, and have been delighting the older residents by taking part in arts and crafts activities, reading books at story time and even rustling up tasty homemade Easter treats. Councillor Danny Thorpe, Leader of the Council, said: “It was a great morning visiting Lakeview Court with Waterways Nursery. Our children’s centres offer diverse, exciting and community-focused projects all across the borough, and we are lucky to have them. It is wonderful to see the children engaging with residents at Lakeview Court in such a unique way; it was clear that fun was had by all”. Walter, 79 and a resident at Lakeview Court, said: “These are my favourite mornings. It reminds me of the time I spent with my own Grandpa. Having the children here makes you feel so special – we all wish they could stay longer”. The Royal Borough of Greenwich plans to extend the project to further nurseries in 2019/2020.